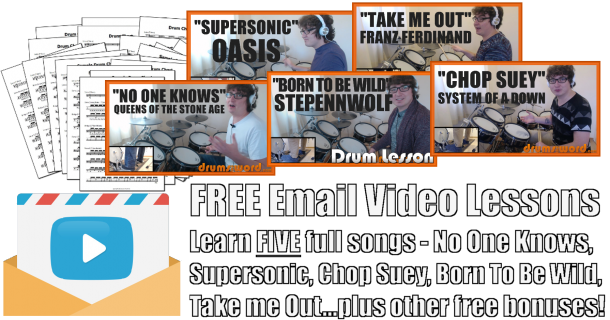 In this free drum lesson, I have the intro drum beat from “Torpedo Girl” by Kiss, featuring the drumming of Anton Fig. It was actually the studio drummer Anton Fig that played drums on this whole album and features some of his trademark funky grooves with this intro drum beat being no exception. Anton comes in with the drum fill and then plays quarter notes on the bell of the Ride cymbal, whilst his hi-hat foot steps on the upbeats eighth notes. This creates the framework for Anton to then lay in plenty of ghost notes to fill out the gaps. The snare drum back beat falls on the “a” of beat 1 in each bar with the second backbeat falling on beat 4, which alternates between the high and medium tom. The bass drum supplies a cool push to the groove around beat 4 playing the “a” of beat 3 as well as the “e” of beat 4 every bar the medium tom is played. 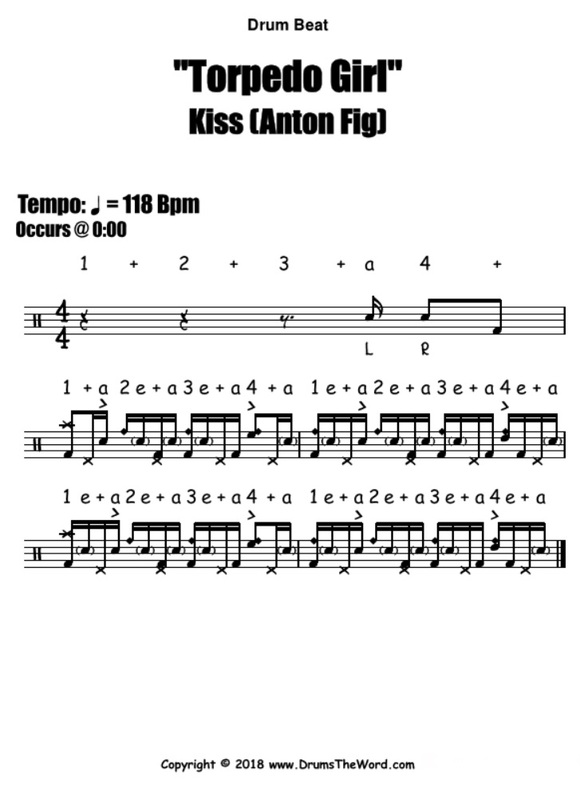 Notice that when Anton comes in with the first bar after the fill he doesn’t play the “e” of beat 1, but when the two bar pattern is repeated on the third line below he does.